The House of Representatives recently passed legislation to clip the rulemaking ability of the Securities & Exchange Commission. While that action unto itself should surprise nobody, compliance professionals should heed a larger picture here that could make your jobs much more unpredictable. Moreover, the bill would also require the SEC to do the same extensive cost-benefit analysis of all its current rules within one year of the legislation becoming law. Then the agency would need to perform a “look-back” cost-benefit analysis on all SEC rules every five years. As a bonus, since the Public Company Accounting Oversight Board is appointed by the SEC, the bill would require the same treatment for PCAOB rules governing the audit industry. The House also passed a separate bill imposing the same duties on the Commodities and Futures Trading Commission. The intent here clearly is to overwhelm the SEC (and its sister agencies) with review work, so it cannot issue any new rules. All the while, Republicans elsewhere in Congress will be busy trying to cut the agency’s budget. As I mentioned, however, this bill to hand-cuff the SEC is only one part of a larger picture. Last week the House also passed the Regulatory Accountability Act, again along a largely party-line vote of 238-183. The bill would update the Administrative Procedures Act, a 70-year-old statute that created the rulemaking process of agency proposals, public comment, and final adoption that we all know today. The crucial point in this legislation is that when someone challenges a regulation in federal court, a judge will no longer need to defer to the regulatory agency’s belief that the rule is necessary. Instead, the judiciary will have far more discretion to insert its own judgment on whether an agency was rational and justified in issuing a new rule—rather than the current standard that agencies be given the benefit of the doubt. Now consider these two pieces of legislation together. The SEC Regulatory Accountability Act would set a far more exacting standard for the agency to issue new rules. Consequently, critics of the SEC would have more opportunity to say the agency didn’t meet its cost-benefit analysis burdens, and then challenge the new rule in court. And the broader Regulatory Accountability Act would also give judges much more discretion to substitute their own beliefs about the necessity of a regulation, rather than defer to the agencies. And we currently have more than 100 vacancies on federal courts around the country, since Senate Republicans stonewalled Obama Administration nominees. That’s the bigger picture. House Republicans want to raise the bar for issuing new regulations, and lower the bar for overturning them in court—on the assumption that Senate Republicans will now fill the federal courts with like-minded judges, so anti-regulation forces can forum-shop for a favorable judge and have an easier path to victory. Regardless of your politics, compliance professionals should remember: above all, you want clear and effective regulators. Well, if this scenario comes to pass, you won’t have them. Regulatory agencies won’t be able to respond to new concerns in a timely manner. When they do respond, other parties will have an easier path to get rulemaking decisions overturned. That injects unpredictability into your compliance regime, and unpredictability does you no favors. I see the Republicans’ frustration here. Regulatory compliance is burdensome, and plenty of compliance requirements are duplicative or outright unnecessary. But that only makes the argument for smarter regulation, supported by more thoughtful laws. What the House wants to force now is anti-regulation, pure and simple. And let’s remember, lawmakers are more beholden to special interests than regulators. Ann Wagner, sponsor of the SEC reform bill, received $613,000 in the last election cycle from financial and insurance firms. The sponsor of the broader regulatory reform bill is Bob Goodlatte, the same one who tried to gut the Office of Congressional Ethics earlier this month. He’s more in bed with telecom and manufacturing companies than financial firms. Do regulators play to certain audiences too? Sure—to the law and accounting firms that give them cushy, partner-level gigs when they finally return to the private sector. But that’s a lot less dangerous than what House Republicans are trying to advance now. Regulators still want regulatory agencies to succeed, even if “success” goes in a political direction you individually might not like. Congress wants to defang regulatory agencies entirely. Will the House Republicans’ efforts succeed? We don’t know. No comparable legislation has been introduced in the Senate yet, and Democrats have a far stronger hand to play there than in the House. Now would be an excellent time for Jay Clayton, the Trump Administration’s nominee to head the Securities and Exchange Commission, to speak up. I suspect that getting politically neutered is not a procedure he wants to experience as SEC chair. Compliance officers shouldn’t want to see it happen either. 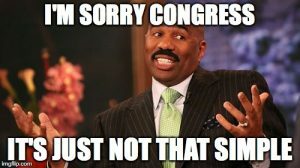 Congress can do better.